There are many reasons why Karl Lagerfeld is an absolute hero. Who else can honestly get away with his silver/white ponytail, severely starched collars, sunglasses and leather driving gloves combo without looking like a lost elderly vampire? Well, no one can really. There was the exquisite Paris-Bombay show in December which was absolutely breathtaking (there were little Chanel choo-choo trains chugging along gigantic banquet tables!!) and this week Karl pulled another awesome show out of the (probably quilted leather) bag. The Chanel couture Spring Summer 2012 show took place at Grand Palais…. inside a purpose-built aeroplane shell. 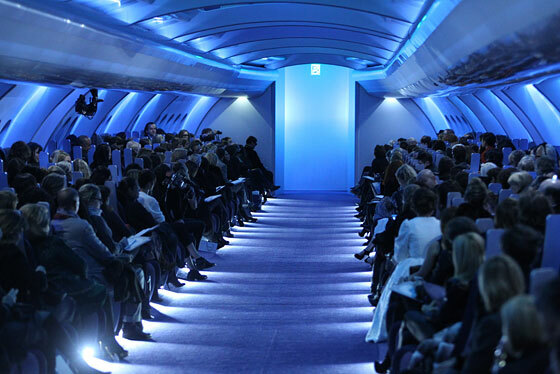 With a wide runway (or aisle), numbered seats and a view of clouds though the transparent roof, production of this show must have been both a dream and nightmare job. As you’d expect from Chanel, the collection was elegant and showcased subtle and often extremely complex detail. So how would a show like this close? I was absolutely delighted to hear that before taking his bow, Karl appeared before a mock cockpit, naturally daah-link.